Studies show 5 proven tricks to eat less food and calories. I found most of these five tricks (that are proven to help you eat less food and less overall calories) while reading a fascinating book recently called 59 Seconds by Richard Wiseman. I think you'll find these very helpful if you're looking to control your caloric intake and reduce your body fat. Several studies prove that the size of the bowl, plate, or spoon that you use can directly influence how much food and calories you consume. Richard Wiseman, in the book 59 Seconds , talks about one study conducted where party guests were randomly given either 17 or 34-ounce bowls and 2 or 3 ounce spoons, and allowed to help themselves to ice cream. It was found that the party guests given the large spoons and large bowls had eaten 14% and 31% MORE ice cream respectively, than the people using the smaller spoons or smaller bowls. Interesting huh! Another study conducted at the University of Pennsylvania used a bowl of M&Ms that were left in the hallway of an apartment building. A sign next to the bowl told people to help themselves to the M&Ms. Some days a tablespoon sized scoop was used in the M&Ms and on other days, a larger scoop was used in the bowl. The researchers found that the larger scoop caused people to take TWICE the amount of M&Ms on average compared to the people that had used the smaller scoop. I've also seen studies referenced in the past that showed that people who used larger plates consumed more calories than those using smaller plates. Starting today, make sure ot use smaller plates, bowls, and silverware. This simple little trick simply forces you to consume less. It also gets you over the guilt of possibly leaving food on your plate, even though your appetite is already satisfied (can you hear your parents saying, "clear your plate"?) This also means saying NO to seconds and thirds! You've probably heard before that eating slower can help you to eat less because it gives time for the fullness signal to reach your brain and thereby shut off your appetite before you've eaten too much. However, this study below found a twist on this! The results were interesting... Eating at the slower rate caused the men to eat less, but not the women (that's weird!). However, the 3rd group that combined the normal pace at first with the slower rate after that caused both the men and women to have a large reduction in their appetite and eat less. The normal-slow combo was found to be more effective than just the slow-only group. Why? I have no idea, but those are interesting results! Mr. Wiseman stated that the lesson here to eat less is "to start at your normal speed but then savor each and every mouthful ". Eating should be enjoyed, not rushed. Take the time to enjoy the food you've prepared, or someone else prepared for you. Chew your food, taste your food, and love every bite! According to the book 59 Seconds, a series of experiments conducted in offices compared putting chocolates right on people's desks vs placing the chocolates six feet away. In another experiment, the chocolates were put inside either transparent or opaque jars. 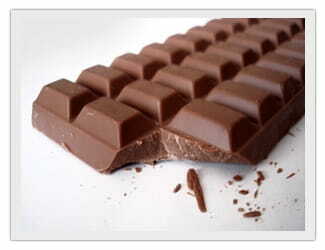 When the chocolates were placed on the person's desk instead of 6 feet away, people ate on average 6 more chocolates per day per person. Also, the chocolates in the transparent jars were eaten 46% more quickly than the opaque jars. Just shows... out of sight, out of mind! As you may already know, I recommend never even having junk food around your house at all...that way, you're never tempted by it and you're forced to only eat healthy foods... but then you can use your weekly cheat meals to eat junk food out at a restaurant. That way the junk food is never in your house to begin with! This trick was reported based on a Georgia Tech study. The study essentially found that people tend to subconsciously eat bigger portions of food when their plate is the same color as their food . It seems like an odd association, but remember that a lot of these are always subconscious things that we don't realize are happening. In this particular study, the scientists theorized that less color contrast between plate and food makes our brains work harder to figure out appropriate portion sizes. 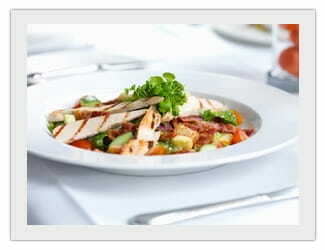 More color contrast between plate and food would make people eat slightly smaller portions subconsciously. Studies have found that people eat significantly more when they are distracted by TV, movies, games, or other distractions. In one experiment mentioned in the book 59 Seconds , people who were more absorbed by a movie ate significantly larger amounts of popcorn compared to those that were paying less attention to the movie. In another experiment, people who actively listened to a detective story during lunch (being distracted by the story), ate 15% more food than those who sat in silence during their lunch. 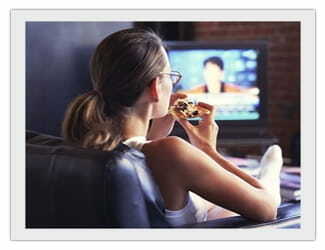 The lesson -- ditch the TV and other distractions and focus on your food! Eating while watching television, or surfing the web, leads to "mindless eating", which not only causes you to eat more food, but leads to more bouts of acid reflux, and other digestion issues because you're not properly chewing your food. 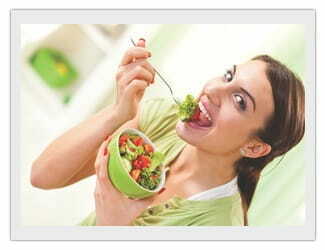 Enjoy every bite of your food and you will naturally consume less calories while enjoying your food more. Very interesting learnings with these 5 tricks huh!